For years it wasn’t legal to open a distillery in any but three counties in Tennessee. But in the years following a 2009 law change, distilleries have been popping up all over the state, just as they had nationally all through the past decade. Modern small-time distilling tends to follow a more historical than industrial model, with Tennessee’s next distillery expected to open in Leiper’s Fork, an area that for years was known for moonshine. Heath Clark, Darek Bell and Mike Williams are among the key movers and shakers who brought whiskey out of the hollers and into the marketplace. They worked to get artisanal distilling legal in Tennessee, and now are distilling themselves. 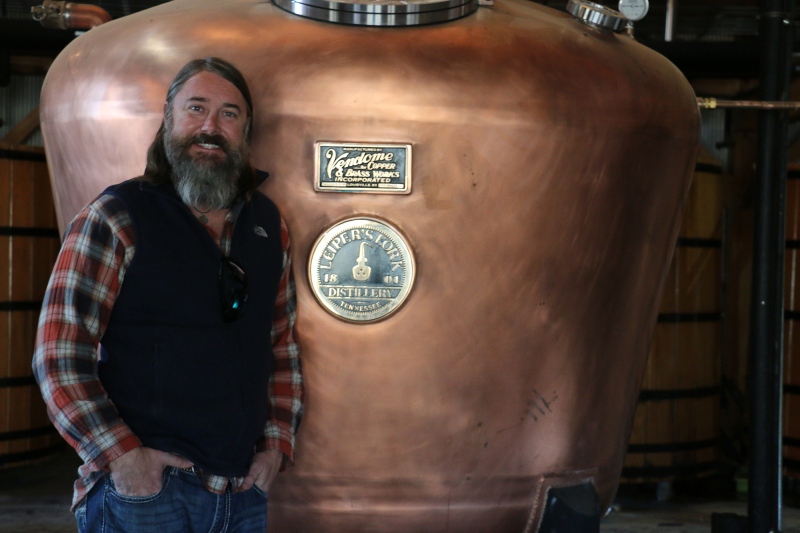 Heath Clark has been traveling throughout East Tennessee to expand the footprint of his product, made in a small distillery in Thompson’s Station. Williams continues to work on his new distilling venture in Columbia, after selling one of the first new brands of Tennessee Whiskey in decades, Collier and McKeel, to a California company. Bell, who had to start his business in Kentucky because it wasn’t legal in Tennessee, just opened his second location in Nashville. These three set the stage for local Lee Kennedy to open his whiskey concept out off of Southall Road. Recently Kennedy was fully involved in construction of his distillery, wearing the thick work boots, a plaid shirt and denim jeans of a construction worker with a grayish red beard crawling down from his chin. His distillery is expected to open in May. A set of books from the 1920s piqued his interest in the distilling craft early. Reading the works of a professor in the 1920s, Kennedy researched moonshining and its art form. He’s been hooked ever since. Even with the law changed, Kennedy had to go through a fairly detailed process with Williamson County to open the facility. He first wanted to chase his idea before the state laws were rewritten, and those involved with the county’s government and planning didn’t have a way for him to do it. After the new law was passed, Kennedy assisted in creating a new zoning district for the county known as RP5. It’s restrictive, but it allows him to produce on a small scale. He started engaging in that process back in 2012. Obtaining his building permit three years later in 2015, Kennedy and his crew have been working since on the 5,000 square foot space. An 1825 cabin, undergoing the process of restoration, will become the gift shop and the tasting area. A courtyard will separate the cabin from the still, where they plan to have music and entertainment from time to time. The Leiper’s Fork Distillery will produce only 10 barrels in a week. Subscribing to the Lincoln County process, he will produce sugar maple charcoal to filter his whiskey. Their charcoal filter tank is a mini version of the one found at Jack Daniels in Lynchburg. However, it will take him roughly five years to make what Jack Daniels distills in a day. He intends to sell only Tennessee whiskey, and he wants to bring back the heritage of White Maple Distillery, an old time Williamson County brand. He’s contacted family members and that national archives, searching for a snapshot of how the distillery operated and functioned. Starting in March before it’s grand opening, Kennedy will start making his whiskey. A large copper still sits in the center of the unfinished room, with gauges and machinery sitting around to finally make this whole process possible.